SOLD OUT. Call 925-685-1181 to be placed onto a waitlist. 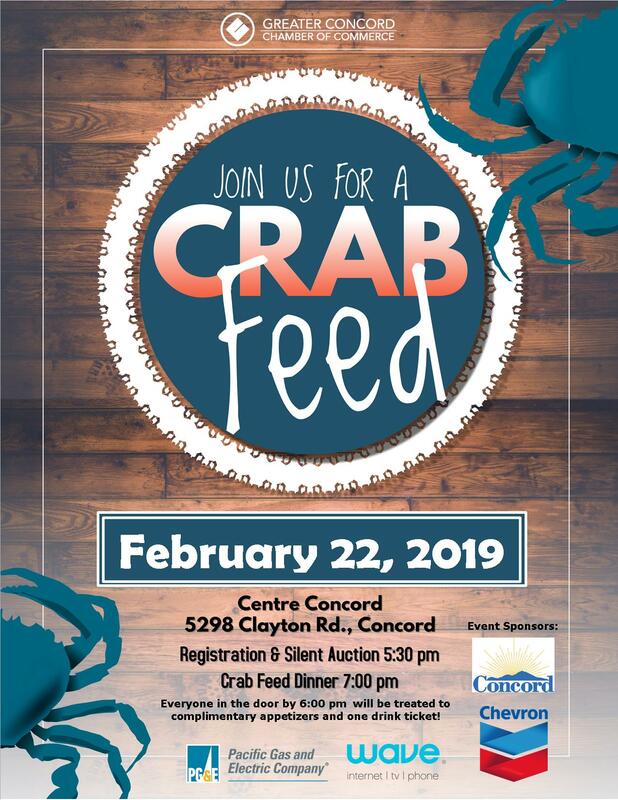 Join the Concord Chamber for our Annual Crab Feed Dinner & Auction! Everyone in the door by 6:00 pm will be treated to complimentary appetizers and one drink ticket! Platinum Sponsor—$2,500: Billing as the ‘Platinum’ Sponsor with company name & logo on advertising collateral pre-event & during event. Public acknowledgement at event as Presenting Sponsor & recognition on auction materials. Opportunity to provide promotional business flyers to all attendees. Includes premium seating plus 2 bottles of premium wine, premium seating for 10. Gold Sponsor—$1,000: Billing as ‘Gold’ Sponsor on pre-event and event print marketing. Recognition with company name & logo displayed at table. Opportunity to provide promotional business flyers to all attendees. Includes premium seating plus 2 bottles of premium wine, reserved table for 10. Silver Sponsor—$750 each: Special recognition at event with company name & logo on table. Includes premium seating plus 2 bottles of premium wine, reserved table for 10. Bronze Sponsor—$600 each: Company name on table. Includes preferred seating plus 2 bottles of wine, reserved table for 10.